In this file photo, U.S. President Donald Trump and Russia's President Vladimir Putin talk during the family photo session at the APEC Summit in Danang, Vietnam, Nov. 11, 2017. 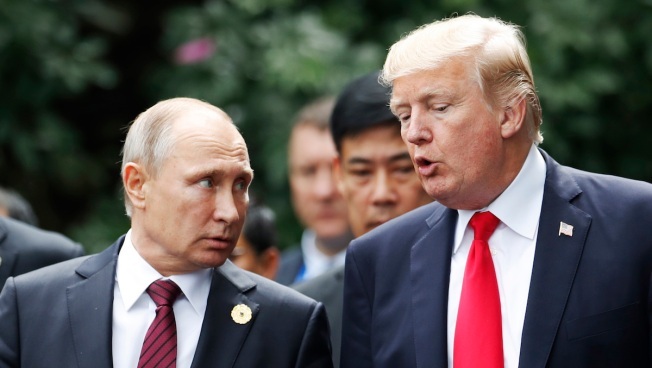 A week after President Donald Trump's widely panned meeting with Russian President Vladimir Putin, a new poll shows that a majority of Americans believes the Kremlin has compromising information on the American leader. By a 51-to-35 percent margin, U.S. voters are convinced the Russian government has dirt on Trump, according to a Quinnipiac University National Poll, CNBC.com reported. At a news conference in Helsinki on July 16, Trump stunned the world by accepting Putin's denial that Russia attacked the 2016 U.S. election, contradicting the findings of 17 U.S. intelligence agencies.